The Ohio State University Department of English offers students the opportunity to think critically about a wide variety of literary, popular and scholarly texts; to understand the historical and cultural contexts in which these texts are produced; and to compose critical, scholarly and creative texts of their own. Our nearly 100 faculty members engage in scholarly research and teach undergraduate and graduate courses across a vast array of areas. The Literary Locations Program focuses on the literature of a particular region or city. Students spend regular semester hours in the classroom and 10 days abroad with the course instructor. Locations include: Venice, Rome, Florence, Paris, Ireland and Oxford (England). 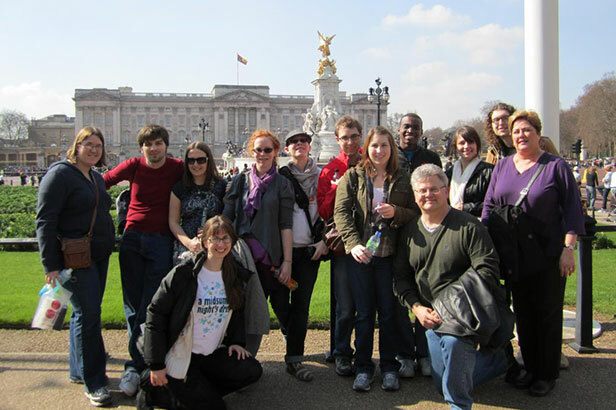 Students in the Literature and Culture of London program travel to London for four weeks during the summer term with an English professor studying literary and cultural representations of this world city and its environs. Our undergraduates benefit from a highly flexible major that introduces them to the expanding field of English studies but also enables them to study an area of interest in depth. In addition, many of our students benefit from interdisciplinary study, through double majoring or minoring in fields such as business, communications, creative writing, dance, design, education, political science, professional writing, psychology, public affairs, sociology and studio art. Our graduate students pursue either a PhD in English or a Masters of Fine Arts in creative writing. While engaged in advanced study, our graduate students teach courses, participate in department-sponsored scholarly activities and present their research and creative work in publications and at international conferences. Our PhD program is home to world-famous scholars specializing in a range of areas in English, including rhetoric and composition, narrative theory, folklore, literacy studies, U.S. ethnic and postcolonial literature and all historical periods of English and American literature. Our faculty experts cover a wide range of teaching specialties and interests. The diversity of thought and approaches among our faculty means that students develop expansive understandings of literary, cultural and linguistic subjects. The department’s primary undergraduate student organization sponsors social, community, academic and professional development programs that build a strong sense of community among undergraduate English students. EUGO members represent undergraduate interests, serve alongside faculty and graduate student representatives on several committees as full-voting members and regularly assist with department functions, including the annual book drive, welcome events and graduating seniors banquet. Founded in 2008, the Sigma Tau Delta Alpha Pi Iota chapter is the university’s only English honors society. Sigma Tau Delta recognizes high achievement in English language studies, literary engagement and writing. The organization brings together more than 40 members with extensive creativity, intellectual ambition, humor and altruism. Because of the breadth and depth of the department’s course offerings, undergraduate students in the Department of English are well prepared to pursue careers in a variety of fields, including but certainly not limited to: arts and non-profit administration, business and technical writing, communications and marketing, consulting, education, editing, finance, human resources, journalism, media (including social media) production, publishing, sales, social services and technology services.